With three straight impressive wins, No. 3-ranked Ultimate Fighting Championship (UFC) women’s Strawweight contender, Jessica Andrade, was anointed as perhaps the one female who could disrupt the dominant reign of undefeated division champion, Joanna Jedrzejczyk, at UFC 211 tonight (Sat., May 13, 2017) inside American Airlines Center in Dallas, Texas. That wasn’t the case, though, once the fists — and feet — started flying, as Jedrzejczyk earned a unanimous decision win against the most durable, game 115-pound female fighter on UFC’s roster. Jedrzejczyk opened up the action with a low kick and continued to pepper her with shots until Andrade finally responded with a violent combination that caught the champion flush. Moments later, while pressed up against the fence, a huge knot began to form on Jedrzejczyk’s forehead. 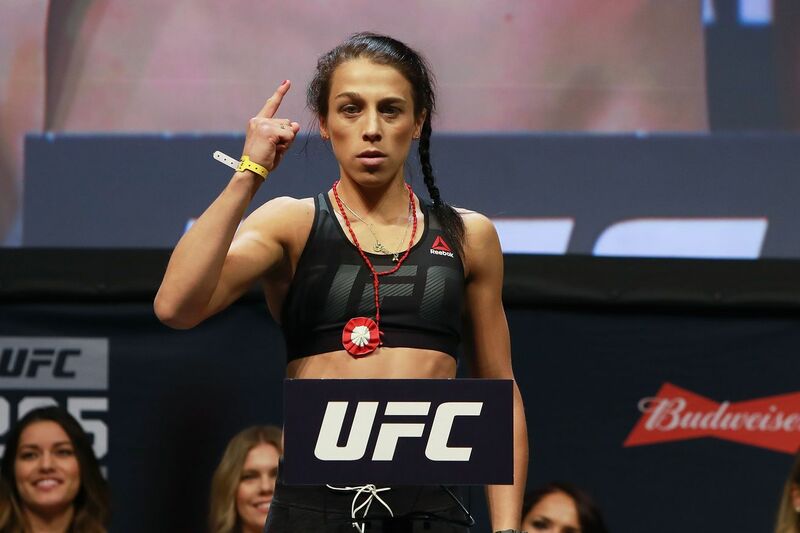 Before long, Andrade slammed her to the canvas and attempted to unleash some ground-and-pound; however, Jedrzejczyk got back to her feet and they headed back to the center of the Octagon. Jedrzejczyk clipped her with a nice head kick, but Andrade continued to press forward like an possessed bulldog. Andrade chased her toward the end of the round, looking to land a big shot, but when that didn’t come she settled for a slam. In the scramble to get back to her feet, Jedrzejczyk connected with a nice short elbow as the round came to a close. Jedrzejczyk started the second stanza much like the first — with incessant low kicks to Andrade’s lead leg. Andrade attempted to corner her, but Jedrzejczyk was able to circle away and keep the fight at a comfortable distance. Andrade continued to rush in with her head down and winging punches, but Jedrzejczyk was just too skilled to get clipped. In fact, she countered the heck out of Andrade, who just ate shot-after-shot and kept moving forward. It’s unclear how Andrade was just able to walk through the barrage of hard strikes, ultimately ending the round with a takedown. Andrade was able to land a straight right to start the third round, but Jedrzejczyk responded with a head kick that once again seemingly had no affect. Jedrzejczyk continued to strafe Andrade’s lead leg with kicks, turning her left thigh into ground beef. In fact, she was forced to switch stances, which seemed to impact her ability to close the distance even more. Frustration began to set in with about one minute remaining in the round as Andrade literally chased Jedrzejczyk around the Octagon with very little success. It was more of the same in the championship rounds, as Andrade chased Jedrzejczyk, who basically treated her opponent’s head like a speed bag. Andrade walked right through them, though, in zombie-like fashion. Her chin is serious — Jedrzejczyk hit her with everything she had — and she somehow just shrugged it off and kept looking for the desperation Hail Mary shot. It never came, though, as Jedrzejczyk coasted to a very technical and impressive unanimous decision win against an insanely game opponent. For complete UFC 211: “Miocic vs. dos Santos 2,” including play-by-play updates, click here and here.